‘It changes phase’ is the scientific phrase for the transformation of water into vapor and back again. 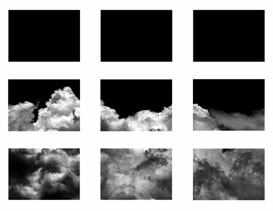 These composite cloudscapes, photographed mostly in the Highveld in South Africa, deal with the ephemeral nature of information and stand in as a metaphor for transience and change. Photographed with my Blackberry Smartphone they are then Bluetoothed to my computer where the data is processed and stitched together. 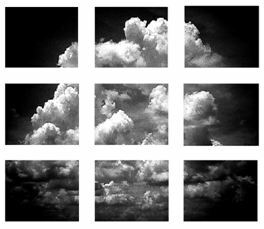 These digital images are then saved on a hard drive and are exhibited as projections, never taking form as a fixed photographic print. In a similar way that water particles transform from a liquid solid into vapor and back again to form clouds so does digital information and image transfer transform in this process.